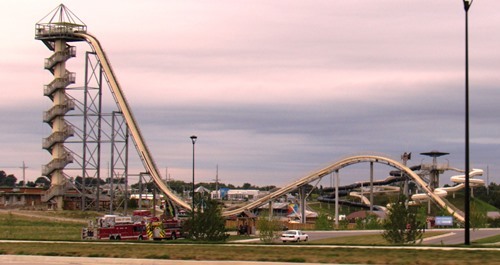 Schlitterbahn to remove fatal water slide in KCK – Welcome to Wyandotte Daily! Schlitterbahn announced tonight that it will be removing the Verruckt water slide. Known as the tallest water slide in the world, the Verruckt at Schlitterbahn water park in Kansas City, Kan., was the site of a fatal accident that killed the young son of a Kansas state legislator in August. A spokesman for Schlitterbahn, Winter Prosapio, said tonight that the decision has been made to tear down the water slide and never use it again. While there has not yet been a lawsuit filed, she said Schlitterbahn and the families of the victims are still meeting and talking. She said the investigation of the Kansas City, Kan., Police Department is still open. She added that while there is currently no lawsuit, the Schlitterbahn water park cannot actually remove the water slide until it has legal permission to do so. Schlitterbahn is a family business originally started by Bob Henry and Billye Henry. A few weeks ago, Bob Henry died at the age of 80. “All of us at Schlitterbahn have been heartbroken over the tragedy that occurred on Verrückt. In our 50 years of providing an environment for families and friends to gather, we’ve never experienced this kind of devastating event. The safety of our staff and our guests is our top priority. We are parents and grandparents ourselves and many of us have ridden Verrückt with our own children and grandchildren over the years it operated. “Once the investigation is concluded and we are given permission by the court, Verrückt will be decommissioned – closed permanently and the slide removed from the tower. In our opinion, it is the only proper course of action following this tragedy. “We will, at some point in the future, announce what will be built in its place.